The cliché “you are what you eat” may not be true in the literal sense, but when it comes to a healthy lifestyle, dietary decisions play a considerable role. This is especially true for people combating chronic disease. Food is both a powerful tool to prevent illness, and to treat it, said Seema Kakar, MD, RESD ’09, assistant clinical professor of medicine at the GW School of Medicine and Health Sciences (SMHS) and internist at the George Washington University (GW) Medical Faculty Associates (MFA). 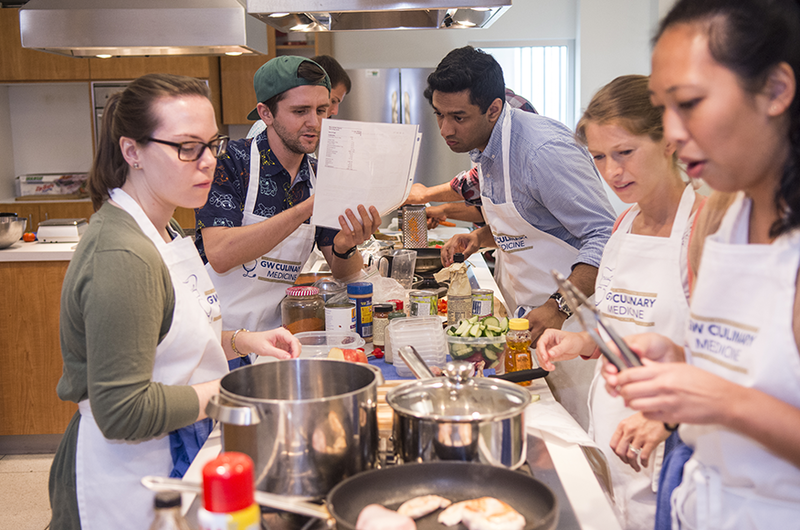 Now, third- and fourth-year MD students can receive hands-on training through a new culinary medicine clinical elective. The class will give students the tools to teach patients real-world skills to alter their diets, shopping habits, and meal preparation to help them feel better, prevent disease, and treat disease, Kakar said. The elective’s curriculum is based on a similar course offered through the Goldring Center for Culinary Medicine at Tulane University. GW joined a consortium of 31 medical schools, two nursing schools and five residency programs that are adapting Tulane’s curriculum to the needs of their students and trainees. The class, which began in September, will be taught by Kakar; GW chef Rob Donis, of the GW Food Institute; Natalie Nicolas, RDN, lead dietician for the MFA; and Gisela Butera, MLIS, reference instructional librarian at GW’s Himmelfarb Health Sciences Library. GW is partnering with the Capital Area Food Bank for the elective. Course faculty will use the organization’s fully stocked teaching kitchen as a “laboratory” in which students will learn and work, according to Kakar. The nonprofit, located in northeast Washington, D.C., works to solve hunger alongside undernutrition, heart disease, and obesity, and is offering students an educational tour of underserved areas of the city, as well as use of the produce in its community garden. “We believe that clinicians will better serve their patients by understanding and being able to teach them about the practical aspects of the science-based nutritional and dietary practices that can improve health,” Kakar said. The new elective is just one of about 15 that have been added to the MD program’s curriculum since it was revised in August 2014. “With the shorter, integrated preclinical curriculum, we are thrilled to be able to provide earlier opportunities for electives in the clinical years,” said Terry Kind, MD, MPH, assistant dean for clinical education and associate professor of pediatrics at SMHS. Other additions to the school’s electives include more traditional offerings, such as physical medicine and rehabilitation and pediatric diabetes care, and more unique options that include hospital administration. For the culinary medicine elective, in each session students learn to cook recipes modified to suit the dietary needs of particular patient populations, Kakar said, such as patients with diabetes, hypertension, kidney disease, and high cholesterol levels, among other diseases. “We’re trying to address some of the big issues that people have,” she explained. The students also must present a final research project on an organization in D.C. that supports nutrition and healthy eating in the community or about a particular issue facing patients, such as eating on a tight budget. A similar class will be offered in the spring, and Kakar hopes the elective becomes more student-driven to meet the needs and interests of those taking it.